The legislature continues to be a very tumultuous and uncertain place. The Senate is currently mired in a leadership struggle as a handful of progressive Democrats and some Republicans are looking to topple Senate President Peter Courtney. This leadership struggle is taking up precious bandwidth in the Senate and is bogging down the process as Senators are more focused on the leadership issues than anything else. The death of Secretary of State Dennis Richardson this past week also cast a pall over the session, both emotionally and from a process standpoint. The Governor has the lawful ability to appoint a successor to the late Secretary Richardson, and has stated her intention to find a 'placeholder' who will promise not to run for election in 2020. This upcoming week is going to represent a major milestone in the 2019 session as the 'Co-Chairs Budget' will be released. This is the legislative response to the Governor's budget that shows how state budget writers would craft the state budget with available resources. It is the first key budget blueprint that shows how the state's money would be allocated without any additional tax increases. The 'Co-Chairs Budget' provides the budgetary foundation for all additional tax and revenue discussions. Usually, it will spawn advocacy for additional taxes and budget investments. Cap & Trade hearings provided a dose of reality. Hearings in the past week in Newport, Baker City, The Dalles, and Bend provided lawmakers with the stark reality that not all Oregonians are clamoring to pay more for their gasoline, natural gas or electricity to put only a very miniscule dent in Oregon's greenhouse gas reductions. In what was expected to be a showcase for the organizing strength of the environmental activists, something else happened....regular working Oregonians showed up and voiced their displeasure with HB 2020 and its associated costs. Medicaid taxes passed. Final passage of the first major Medicaid funding bill, HB 2010, happened this past week. The bill raised over $500 million and will go a long way to closing the state's $623 million budget gap. OSCC issued a floor letter on HB 2010. Our intention was to make sure that legislators understood that HB 2010 will raise over $291 million per biennium from local businesses. It was the first major business cost increase from the 2019 session. Rent control passed. The statewide rent control bill, SB 608, also passed the House and became law as Governor Brown quickly signed the bill. It is the first statewide rent control bill in the nation and limits annual rent increases to 7% plus CPI on buildings over 15 years old. OSCC opposed HB 3022 which overturns Oregon's landmark workers' compensation reforms. OSCC testified against HB 3022 last week, a bill that would have reversed many key, cost-saving provisions in Oregon's workers' compensation system. Before 1990, Oregon had the highest frequency of workplace injury claims, third highest medical costs, and sixth highest premium costs. Today, we have some of the lowest rates in the country and safety programs that help reduce workplace injuries. Oregon's workers' compensation insurance system is one of the last remaining competitive advantages for Oregon companies and OSCC will vigilantly safeguard the system from being compromised. Oregon revenue forecast added another $67 million to state coffers for the upcoming 2019-21 budget cycle. The state is experiencing a rush of short-term revenue that will slightly ease the budget crunch for the upcoming budget cycle. The "kicker" rebate projection was also increased to a whopping $748 million. Independent Contractors. (HB 2498) On Monday afternoon, the House Rules Committee will consider importing California's troubled Dynamex decision. In April 2018, the California Supreme Court determined that independent contractors must meet a new strict "ABC" test in order to maintain their status. That decision impacted 2 million independent contractors in California, making them employees! Now Oregon is looking to follow suit. HB 2498 would add a new test to Oregon's independent contractors: "Do you provide a service different from the business you are working for?" If the answer is "no," HB 2498 would reclassify you as an employee of the business. Implications are broad-doctors, hairstylists, insurance agents, realtors, and many others will be impacted if HB 2498 passes. Lawsuit Damages. (HB 2014) This bill is scheduled for a public hearing in the House Committee on Judiciary this Tuesday. HB 2014 would repeal Oregon's legal limit of $500,000 on non-economic damages in personal injury and negligence lawsuit claims. OSCC, health care groups, and business organizations have traditionally opposed this legislation because it is a significant factor in driving up health care costs and general liability costs for employers. Transient Lodging Taxes for workforce housing. (SB 595) This may clear its first hurdle this week in the Senate Housing Committee. SB 595 would allow local governments to use previously dedicated TLT funds and apply them to local workforce housing development. Currently, 70% of these revenues are statutorily dedicated to tourism and tourism promotion. If the committee approves the bill, it will be forwarded to the Senate Finance & Revenue Committee. OregonSaves penalties. (SB 164) This bill is scheduled for a work session on Thursday. SB 164 would add penalties to the Oregon Retirement Savings Program, which passed in 2015. OSCC worked with the Treasury and other business stakeholders to address our concerns with the initial bill, and these changes will be reflected in a -2 amendment. OSCC has issued an ACTION ALERT for HB 2498 (Independent Contractors) for the House Rules Committee. OSCC has issued an ACTION ALERT for HB 2020 (Cap & Trade) for all legislators. PLEASE RESPOND ASAP WITH YOUR MESSAGE. To date, OSCC has generated 174 letters to legislators on this bill, well short of our goal of 1,000. OSCC has issued an ACTION ALERT for SB 379 (Workplace Marijuana Accommodation) in the Senate. PLEASE RESPOND ASAP WITH YOUR MESSAGE TO SENATORS! (Senators only) To date, OSCC has generated 72 letters to Senators on this legislation, well short of our goal of 250. OSCC continues to ask for your assistance to shine a light on the negative impacts of cap-and-trade! Individual chambers can start by joining the Partnership for Oregon Communities. The Partnership will coordinate grassroots voices with concerns about the rising costs of fuel and energy. Email jessicac@oregonchamber.org to join the coalition. OSCC will follow up as we learn of opportunities for public testimony and engagement with the legislature. The quarterly State Revenue Forecast was issued today. There are two key numbers you need to know. First, the legislature is projected to have an additional $67.7 million in tax revenue to spend for the upcoming 2019-21 budget cycle. This increase in projected revenue will close nearly 10% of the state's structural $623 million budget deficit for the cycle. Combined with the passage of HB 2010 (the $510 million Medicaid funding package), the deficit is nearly closed. Second, the projected "kicker" refund to taxpayers next year will increase from a projected $728 million to a projected $748.5 million. It has come to our attention that some of our members may be unaware of the impacts of Cap & Trade (House Bill 2020) on their commercial, non-profit or light industrial members. Please see this release from the NW Gas Association. The natural gas impacts alone are staggering. Legislators are now eyeing raising $1.1 billion per budget cycle with the HB 2020 cap and trade bill. PLEASE SEE OUR ACTION ALERT AND WRITE YOUR LEGISLATOR TODAY! Today, OSCC issued a floor letter to the Oregon House of Representatives on HB 2010, the Medicaid funding bill, which put a stake in the ground and alerted legislators that although OSCC does not oppose the legislation, this is the first major cost imposed on business from the 2019 Oregon legislature. HB 2010 will cost Oregon businesses over $291 million per budget cycle when fully implemented. You can see OSCC's comments here. Tourism tax diversion for housing? A hearing was held yesterday on Senate Bill 595, which would reduce lodging tax reforms of 2003. If successful, SB 595 would take 30% of the industry's 70% of any new or increased lodging tax implemented since July 2, 2003, allowing local governments to redirect those funds for "affordable workforce housing" projects. This would allow only 40% of new or increased local lodging taxes to be protected for tourism promotion and tourism-related facilities. OSCC is unaware of any further pending action at this time, but will be monitoring this bill. OSCC is also watching the Governor's latest proposal to reduce pension costs by taking $1.4 billion from the SAIF worker's comp surplus. In an article by The Oregonian, the idea is still tentative, but it has already raised concerns from the business community. Oregon Business and Industry CEO, Sandra McDonough, stated that they were concerned "with any proposal that would undermine the fiscal integrity of SAIF." You can read the full article here. At this point, it is still a proposal and OSCC will continue to monitor and let you know as we hear anything. We have now completed three weeks of the 2019 legislative session. The upcoming week appears to be an abbreviated week with several committees being cancelled or otherwise not scheduled to meet this week. Two major bills are moving quickly - rent control (SB 608) and the first Medicaid funding bill (HB 2010). One other major bill is now in full swing - cap and trade (HB 2020). Additionally, the legislative conversations are now underway on a major business tax to fund K-12 education. This discussion is happening every Tuesday and Thursday evening in the Joint Student Success Committee (Revenue Subcommittee). To date, the committee is looking at other state taxing models that utilize gross receipts - Washington, Nevada, Ohio, and others. At this point, it looks most likely that the committee will recommend a gross receipts-based tax and not additional increases to the state's corporate income tax. Medicaid Funding will likely pass Ways & Means this week (HB 2010). This is the bill that will implement the first stages of Medicaid funding proposed by the Governor - the Hospital provider tax ($98 million) and the insurance tax ($410 million). Local hospital systems will support this bill because it eliminates the true tax that was levied on hospitals in 2017-19. However, the bill also increases taxes on commercial health insurance policies from 1.5% to 2%. These taxes will be passed through directly to small business customers. Rent Control will get a Senate vote this week (SB 608). We expect this bill to pass the Senate as early as Tuesday. SB 608 has two key features: (1) it limits rent increases to 7% plus CPI in all buildings over 15 years old, and (2) disallows no-cause evictions after one year. Cap & Trade legislation is now in full swing (HB 2020). OSCC members got a major boost last week as NW Natural clearly articulated the huge cost increases on their natural gas customers if HB 2020 were to pass. They gave legislators a handout that showed massive cost impacts to residential, small commercial, and industrial ratepayer. The invited testimony on HB 2020 will continue on Monday this week. Public testimony kicks off on Friday afternoon at 1:00 PM and is scheduled again on February 18 at 5:00 PM. OSCC participation will be needed as the public hearings go around the state in the coming weeks. Single use straw ban (SB 90). This issue seemed to stall as committee members pressed for exemptions from the 'straw ban' for convenience stores and drive throughs as well as a local preemption that would prohibit more stringent local regulations. Environmental advocates oppose carve-outs and appear to now want to let cities and counties move forward with a patchwork of local regulations. Although SB 90 appears stalled for now, we don't believe we've seen the last of this issue in 2019. Workplace marijuana accommodation (SB 379). In a touch of irony, the proponents for the workplace marijuana accommodation bill were late and almost missed the hearing. OSCC submitted joint testimony with the general business community in opposition to this measure. OSCC has an active ACTION ALERT on this issue. Please contact your senator and ask them to say 'no' to SB 379. Small business tax cut repeal. (SB 211) OSCC is disappointed, but not surprised, to see the Senate Finance & Revenue Committee taking up the issue of repealing Oregon's lower tax rates for pass-through businesses. Oregon's 'small business tax cut' law currently imposes lower tax rates on the first $5 million of business income. SB 211 would apply lower tax rates to only the first $415,000 of business income and then would completely repeal the 'small business tax cut' altogether starting in 2026. Liabilities for Employment Discrimination. (SB 726) Watch out for this bill. This could be very similar to the wage equity bill of 2017 where it is politically impossible to oppose but will have far-reaching impacts on business. This bill started out as targeting sexual harassment, but has morphed into a general employment discrimination bill that creates a new 7-year statute of limitations and holds officers and principals personally liable for discrimination. OSCC is monitoring this bill closely as there is lack of agreement on potential impacts. Workplace Marijuana Accommodation. (HB 2655) This is the House version of SB 379 that would make it an unlawful employment action to condition employment based on refraining from the off-duty use of cannabis. While the bill contains an exception for jobs where the work cannot be performed while impaired, there is currently no easy test to determine if someone is impaired while at the workplace. OSCC is opposing this legislation in the Senate because it is a direct affront on an employer's ability to enforce a workplace drug-free policy. A hearing is posted on the bill this Tuesday in the House Business and Labor Committee. We do not expect the House to move its version. OSCC has issued an ACTION ALERT for SB 379 (Workplace Marijuana Accommodation) in the Senate. PLEASE RESPOND THIS WEEK WITH YOUR MESSAGE TO SENATORS! OSCC has made it exceptionally easy to contact your Senator and ask them to say 'no' to SB 379. OSCC asks for your assistance to shine a light on the negative impacts of cap-and-trade! Individual chambers can start by joining the Partnership for Oregon Communities. The Partnership will coordinate grassroots voices with concerns about the rising costs of fuel and energy. Email jessicac@oregonchamber.org to join the coalition. OSCC will follow up as we learn of opportunities for public testimony and engagement with the legislature. Join us for a day of legislative advocacy in action. The 2019 Chamber Day at the Capitol is scheduled for Tuesday, April 23, 2019. Presentations from legislative leaders and an update on OSCC legislative Priorities will take place during the morning session from 8:30-11:30am. The second part of the day will be free for you to meet with your legislators and discuss issues important to your business community. We encourage you to bring your Board and key leadership. Please note: Due to limited seating, attendance will be limited to three attendees per chamber. ALL OSCC members are invited to join our 2019 legislative priorities discussion on our Government Affairs call at 9:30 AM on Friday, December 28th. Last month, the Bureau of Oregon Labor & Industries released their final rules for employers and employees on Oregon's groundbreaking Equal Pay Act, passed by the 2017 Oregon legislature. The new law that goes into effect on January 1, 2019 requires that employees be paid equally for comparable work regardless of gender or any of Oregon's ten other protected classes. We believe this will be the most challenging human resources issue for most of our Chamber members over the next year. Further complicating matters - and increasing the level of urgency - is that lawsuits are allowed based on violations of the law starting on January 1st. The guide, which you can view here, provides helpful information for your members as they prepare to comply with the new law. The guidance includes an overview of the law, frequently asked questions, a guide for employers on self-evaluations, a sample checklist of policies and practices, and a calculation tool created to assist employers in determining where they have potential wage gaps between employees. As the leading grassroots business organization for our local business communities, we think it's critical that every local business in every corner of our state has access to the best available information on how to implement the new law. We hope you will find that this tool provides great value to your members. On Wednesday, Governor Brown issued her proposed 2019-2021 budget and policy agenda. The Governor's recommended budget includes $23.6 billion in spending, including $2 billion in new revenue for schools that would be raised in the 2019 session. The Governor also outlines a strategy to cover $623 million to fund the Medicaid budget, including provider taxes, cigarette taxes, and employer assessments. Highlights are below. Dissolve the Oregon Department of Energy and replace the agency with a new Oregon Climate Authority that will assume responsibilities for cap-and-trade and clean energy. Subsidized Employer Assessment (from above) - tax employers who do not meet threshold health care contributions for their workers (i.e. those who work 30 hours a week at firms with 50 or more employees who are enrolled in OHP). For additional information, read the 48-page report here. ALL OSCC members are invited to start our 2019 legislative priorities discussion with our first Government Affairs call starting at 9:30 AM on Friday, December 14th. We will be holding regular bi-weekly government affairs calls every other Friday at 9:30am (Dec 28, Jan 11, Jan 25, etc). We are seeking input from ALL OSCC members. Due to significant changes in the legislature, and significant changes in the politics of the state, we will not be going into the 2019 session with a pre-planned agenda. This week, the Bureau of Labor and Industries released the final rules to implement HB 2005, Oregon's Equal Pay Act, that was adopted by the 2017 Legislature. Find a copy of the final rules here. Please note that the effective date for this law is January 1, 2019. When the bill was negotiated in 2017, provisions were included to give employers a partial defense against compensatory and punitive damages if they perform an Equal Pay Analysis described in statute. This analysis must be completed before a private right of action is filed against an employer in order to be eligible for the protections the Equal Pay Analysis offers. In addition to releasing final rules, BOLI issued technical assistance to assist employers with compliance. We encourage OSCC members to review and share this technical assistance webpage. With approximately six weeks until the effective date of this sweeping new law, we know that employers are grappling with how to comply. Last week, OSCC joined several business associations on a letter to legislative leadership and the incoming Bureau of Labor and Industries Commissioner asking for a 1-year delay of the punitive enforcement measures of the new pay equity law. We will keep you updated as we hear from legislators. OSCC will follow up with additional technical resources as this new law rolls out. Oregon's dominant political coalition of progressive organizations scored resounding victories across the board on Election Night as they pushed nearly all of their candidates and ballot measures to victory. The victories were decisive and total. In addition to pushing Governor Brown to victory, the progressive coalition added one Democratic to their Senate majority and a whopping three house seats to their House majority. Democrats now have 'supermajorities' in both chambers. Governor: Republican Knute Buehler (R), once thought to be the perfect challenger to an unpopular Governor Kate Brown (D) due to his moderate and progressive stances, was no match for the incumbent. Governor Brown easily won re-election 50% - 44%. Bottom line: Governor Kate Brown (D) wins re-election to 4-year term. State Senate: As expected, Democrats expanded their majority in the State Senate by one seat. The open southern Oregon senate seat vacated by Republican Alan DeBoer was easily won by Democrat Jeff Golden, who was a former Jackson County Commissioner. Again, this was another instance in which Republicans thought they had their ideal moderate candidate in local tech CEO Jessica Gomez, but Golden won 55% - 45%. This expands the Democratic majority in the Senate to 18-12, which theoretically enables them to pass taxes without Republican support. As of this writing, incumbent senator Chuck Thomsen (R - Hood River) is clinging to a 660 vote margin in Senate District 26. This is the last outstanding race that will give Republicans any relevance at all in the Oregon legislature for the next two years. If Thomsen wins, Republicans may be able to team up with moderate Democrats to block taxes and far-reaching policies. If they lose - and the Senate Democrat majority expands to 19-11 - they will effectively lose their ability to stop or modify anything. Bottom line: Democrats expand majority from 17-13 to 18-12. State House: This is where Democrats scored their most stunning victories of the night and expanded their majority by three seats. Democrats now hold a commanding 38-22 majority and can effectively pass legislation and taxes at will. To gain their newly-minted supermajority, they easily knocked out the three most vulnerable House Republicans and defended their own vulnerable incumbents comfortably. Democrat Courtney Neron scored the biggest surprise of the night when she defeated freshman Republican Rich Vial 51% - 47% in House District 26 (Washington County). In Hood River, Anna Williams defeated freshman Republican legislator Jeff Helfrich 52% - 47%. In West Linn/Tualatin, Democrat Rachel Prusak defeated four-term incumbent Julie Parrish 53% - 47%. Bottom line: Democrats expand majority from 35-25 to 38-22. Ballot Measures: Unions and progressives easily defeated a slate of ballot measures that were proposed by the business community (Measures 103 & 104) and social conservatives (Measure 105 & 106). But in a measure with the biggest impact on business and consumers, environmental groups were successful in passing a gross receipts tax on large retailers to pay for environmental programs (Portland Measure 26-201). Measure 102 allows for private ownership and management of housing projects funded through local bond levies. Private involvement was previously prohibited. Measure passed with 56%. OSCC Supported. Measure 103 would have pre-empted all state and local taxes on groceries. It was defeated with 57%. OSCC Supported. Measure 104 would have required 3/5th "supermajority" votes in the legislature for all revenue raising legislation. It was soundly defeated with 65% opposed. OSCC Supported. Measure 105 would have repealed Oregon's sanctuary state law. It was defeated with 63% opposition. Measure 106 would have prohibited the practice of taxpayer funds for abortion procedures for Medicaid recipients. It was defeated with 64% opposed. Portland Measure 26-201 imposed a gross receipts tax on large retailers in Portland and directed new tax revenues to a "Clean Energy" fund. Estimated to raise between $30 million and $80 per year, it easily passed muster with Portland voters with a whopping 64%. Bottom line: Progressives mount successful defense of all ballot measures and pass sweeping new gross receipts tax in Portland for "large" retailers. We are one week out from the election and we need your help! OSCC has given our official endorsement to Measure 103 and Measure 104 and now we are in the final days to support these campaigns to pass these critical measures. Send a message to your members asking for their support. You can learn more about these measures by visiting VoteYESon103.com and YESon104.com. Review the Yes on 103 one-pager and Yes on 104 one-pager and share them with your members and community. Most importantly, vote YES on Measure 103 and Measure 104 and return your ballot by November 6th. The last day to mail your ballot is Wednesday, October 31st. After that, ballots should be returned to an official election drop box. Click here to locate a drop box near you. By supporting these measures, OSCC is standing with Oregon's businesses and families. Every vote matters and every vote will make the difference this election. Ballots are now being mailed and now is the time to re-double our efforts to support pro-business issues! Five times in the last 10 years there have been efforts to put a tax on groceries in Oregon. What you see day-in and day-out through your work and in our community brings home the need for us to act permanently to keep our groceries tax free in Oregon. We are supporting the effort called, "Vote YES on Measure 103! Keep Our Groceries Tax Free." Watch this two minute video explaining this effort. Yes! Keep Our Groceries Tax Free - Informational Ad - Our Mission. Simple: It keeps all groceries free from any taxes based on sales from farm to fork regardless of the size of the business. Specific: Groceries are defined as any raw or processed food or beverage for human consumption excluding alcohol, marijuana, and tobacco. Permanent: This is a constitutional amendment to prevent the Legislature or local governments from reversing or tampering with the Measure. It permanently removes their ability to pass a tax on groceries! 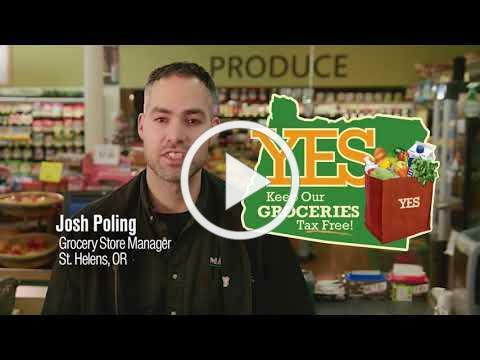 Earlier this year, the city council in St. Helens, OR attempted to implement a tax on groceries. Citizens responded by passing a local referendum identical to Measure 103 - 89% Yes to 9% No to permanently prohibit any sales tax on groceries in their city. Let's extend this protection statewide by passing Measure 103. Thank you in advance for helping all Oregonians. YES! KEEP OUR GROCERIES TAX FREE is a winner with your support. Attached, please find additional information about what the opponents are saying and why their claims are false. Again, ballots are now in the mail. Measure 103 will pass if local chambers can mobilize their members and their community! Join OSCC and Oregon's business community in supporting a crucial ballot measure this November. Measure 104 is a constitutional amendment that would help protect Oregon businesses against easy tax hikes. OSCC have given the measure our official endorsement and now we need to work with the Oregon business community to support the campaign to pass it. According to Oregon's constitution, a 3/5 supermajority vote is required on all legislation that raises revenue. But, politicians have introduced dozens of bills during the past two legislative sessions that would circumvent this requirement. Oregon politicians have long been in pursuit of a carbon tax, known as cap and trade. The legislation would require Oregon companies to pay a tax on carbon emissions which would hurt consumers by substantially increasing the costs of transportation, food and utilities, while also resulting in job losses. Politicians attempted this without a supermajority vote and without providing Oregonians evidence that it would result in reduced carbon emissions. Each of these proposals could have been passed with a simple majority - not the three-fifths majority vote envisioned by Oregon voters. Ballot Measure 104 ensures that any legislation that raises revenue requires a three-fifths majority vote. This includes fees or the elimination of tax exemptions, deductions or credits - making it clear that Oregonians are done with politicians working behind closed doors to increase taxes. You can help by contributing to the campaign today. Donate online by clicking here or use this donation form to send with a check. Thank you in advance for your generous support for the A Tax is a Tax Committee. Your donation will help us pass Measure 104 to protect Oregon businesses from unfair tax hikes. In 2017, the Oregon legislature adopted the most comprehensive pay equity legislation in the country. That law, HB 2005, passed unanimously in both chambers after the original legislation was amended as part of a compromise between business and labor representatives. The law will go into full effect in January 2019 and reform the way employers consider payroll and communicate with their employees about compensation. As recent articles have suggested, it is incredibly COMPLICATED. To learn more about what you will need to do to comply, click here. What do you need to know as a business owner or Human Resources professional? As of October 2017, it is no longer legal to ask a job applicant for prior salary history. An employer may not lower the wages of employees to bring their overall compensation structure into compliance with the law. Beginning on January 1, 2019, the law requires that employees be paid equally for comparable work regardless of protected class status. Additionally, there are specific requirements regarding communications with employees and applicants about compensation. Once the draft BOLI rules are finalized, businesses have until the end of 2018 to review employee handbooks, new hire processes, and pay practices to move towards compliance. CORRECTION: A private right of action is triggered on January 1, 2019 for the bill, except for questions about past compensation (For that section, civil penalties are triggered in 2024). This means that businesses have a VERY SHORT window to get in to compliance before employee lawsuit provisions come in to play! Help OSCC weigh-in during the rulemaking process. Although the language of the bill isn't up for debate in the rulemaking, BOLI's interpretation is. BOLI is accepting comments until October 12, 2018 at 5pm. We are asking chambers to submit comments on the rulemaking. Please click here to see suggested talking points and a draft letter. Comments can be sent directly to Christine Lewis, BOLI Legislative Director at christine.e.lewis@state.or.us. Feel free to cc your state representative and/or senator on your comments. This law is complicated and comprehensive. OSCC will need all-hands-on-deck to address any issues with implementation in the 2019 session.